halloween layered cake | what is clara eating today? Another recipe recreated from Parenting.com. You can make these in glass cups or in glass jars with a lid. I like the glass jar option for easy storing in the refrigerator and to pack as snack for school. you can make these any way you like, but here is how i made this. i baked the chocolate cake in a cake pan that was large enough to spread the cake batter out into thin layer (3/8in thick) and baked for 10 minutes. used a circle cookie cutter that was the size of the jar (if you are using a cup, just use the top of the cup to cut out the correct size) and cut out three circles. 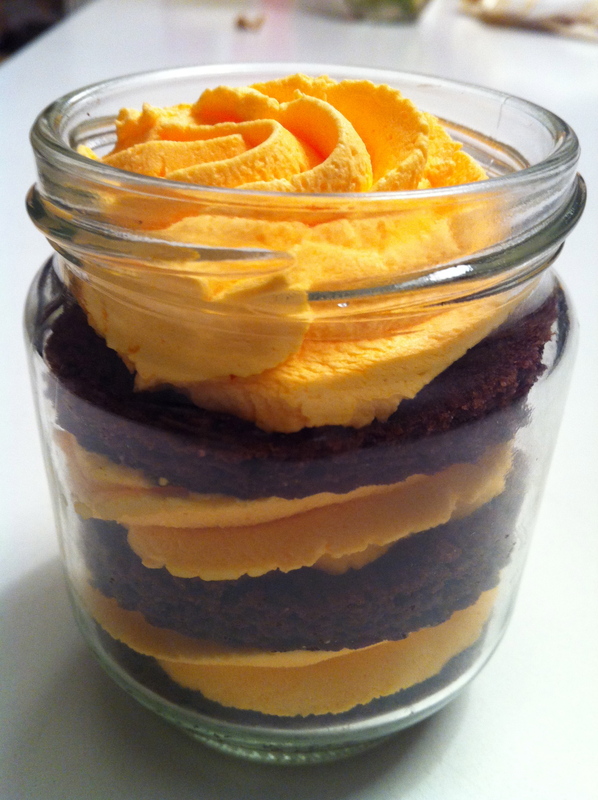 place one cake at the bottom of the jar, then pipe out, or spoon in 1/3 of the cream. repeat three times. if you close the lid and store in the refrigerator, it stays fresh for a few days. i would imagine it will freeze really well too, but haven’t tried it. Posted in desserts, for school, nut-free, snacks, something fun!, special day? wow wow!! This is fantastic, I want to eat it. thanks for sharing.